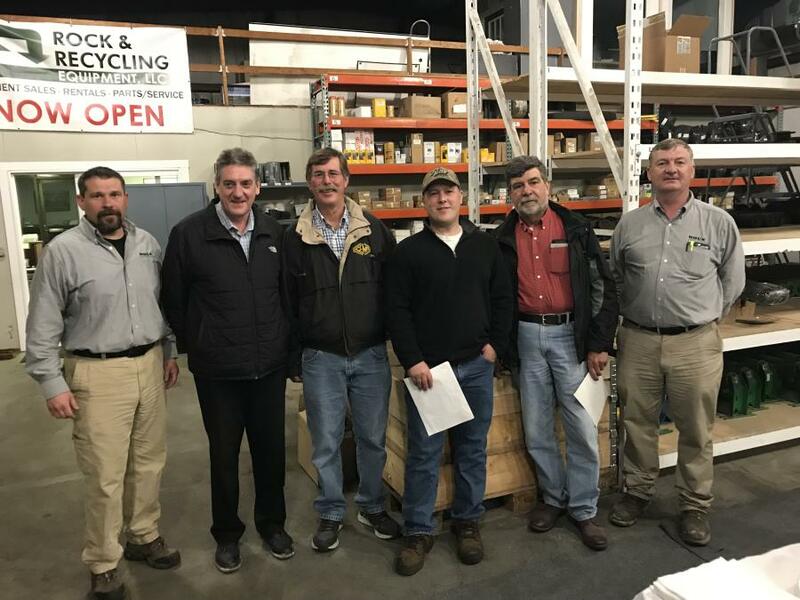 (L-R): Shane Fleming, Paschal McCloskey, Peter Adams, Kyle LaHouse, Skip Potter and Brendan Fox gather for a photo during the monthly Construction Equipment Maintenance Association (CEMA) meeting held recently at Rock & Recycling Equipment. Rock & Recycling Equipment hosted the monthly Construction Equipment Maintenance Association (CEMA) meeting April 25 in Sutton, Mass. CEMA members consist of heavy equipment owners, operators and technicians that meet once a month to share relevant industry knowledge. Rock & Recycling Equipment LLC is a corporate member of the group and hosted its April meeting. Rock & Recycling Equipment owners Brendan Fox and Shane Fleming provided dinner and a tour of their dealership for CEMA members during the meeting. Later, representatives Forrest Hooper and Dan Kidd of Volvo Penta did a presentation on Tier IV engine technology. Rock & Recycling Equipment recently became a certified Volvo Penta Industrial Support dealer within New England. Paschal McCloskey, founder and president of McCloskey International, was in New England to visit with many of his long-time and new customers throughout the territory and stopped by for the CEMA event to show his support for Rock & Recycling, which has increased screener, crusher and stacker sales by nearly 300 percent since taking over the dealership in mid-2016. Rock & Recycling Equipment LLC is the exclusive dealer for McCloskey International in New England. The company's main location is in Sutton, Mass., where the company has a fully stocked warehouse of parts to support the equipment it sells. Rock & Recycling also has two fully certified service technicians, along with two fully equipped mobile service trucks. McCloskey International manufactures a complete line of equipment including: cone, jaw and impact crushers; vibrating screeners; trommels and stacking conveyors. Founded in 1985 by Paschal McCloskey, McCloskey International has a 410,000-sq.-ft. manufacturing facility in Ontario, Canada, and a second facility in County Tyrone, Ireland for international customers.